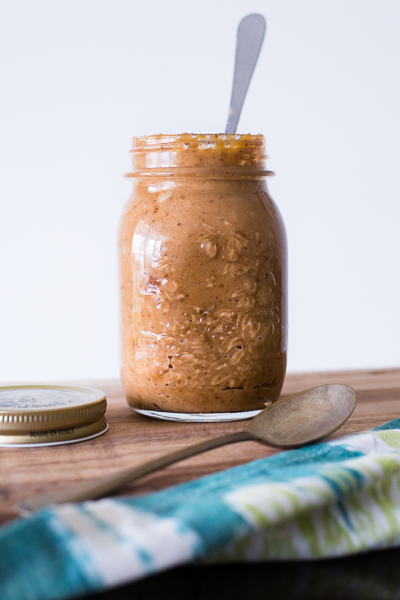 First things first, you need a food processor or a high-powered blender to make peanut butter at home. By high-powered I mean a blender that continues to run at full speed without heating up and turning off every 45 seconds. Mine did. EVERY 45 seconds. So making this took about fifteen minutes start to finish for the blending process as opposed to the five or six minutes it would have taken otherwise. So in summary, use a blender that’s not as old as your husband. Only slightly exaggerating here (our microwave is actually AS old as my husband. 32 years). My kitchen would be a treasure trove for antique junkies. 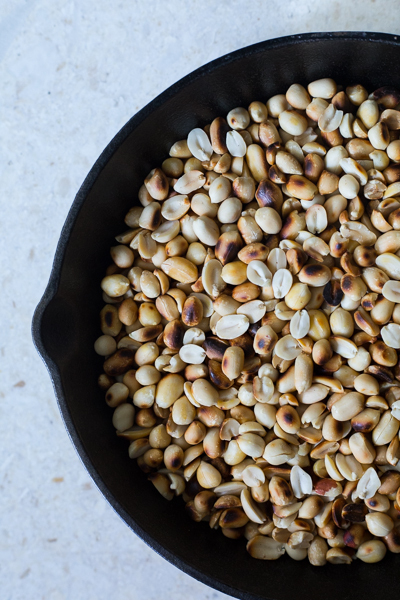 Toasting the nuts for peanut butter—or any nut butter—is a matter of personal choice. I would however strongly recommend not skipping this step unless you are specifically particular about using raw nuts. 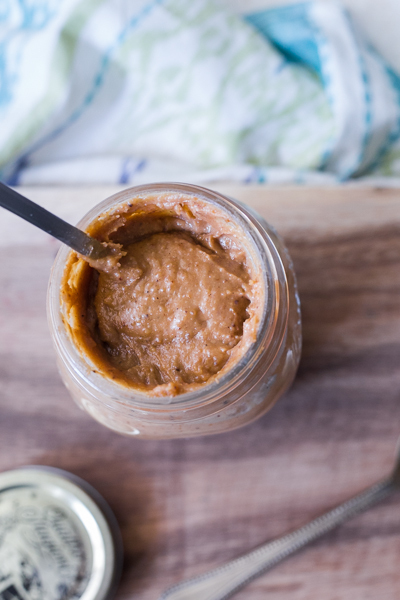 Toasting does double duty here: it creates a resonant smoky, nutty flavour in your finished nut butter as well as helps activate the oils in the nuts that make the blending process easier. I usually make peanut butter by substituting processed sugar with honey or maple syrup, which got me thinking, why not caramelize the sugar before adding it in? I’ve used cane sugar for the caramel but make any sugar substitution you prefer: demerara, brown, or even plain old white sugar would all work very well here. That extra dimension of nutty flavour that you get from the caramel is divine, and a bit of a revelation here. As is always the case, I wish I’d thought of this earlier. First make the caramel: add ¾ cup sugar and ¼ cup water to a saucepan. Cook the sugar over a medium heat without stirring but rotating the pan if necessary, until it darkens to a deep brown colour. Keep an eye on it constantly. Once caramelized, set the pan aside and add the salt. Give it a swirl and let it cool slightly. 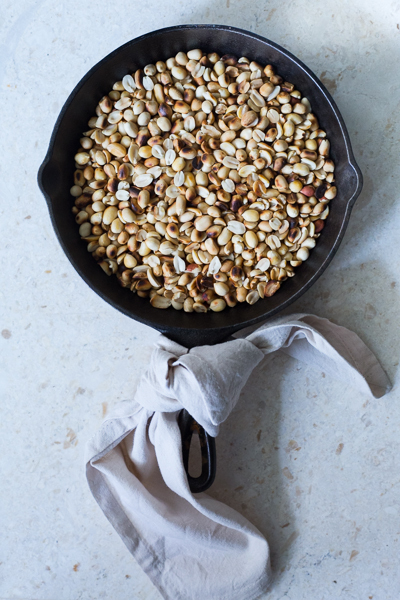 Toast the peanuts in a dry pan until lightly coloured on all sides. Move them around constantly to make sure they don’t burn. If using raw nuts, avoid this step. Add the nuts to a blender or food processor. Pulse a few times until it's coarsely chopped. If you want a chunky peanut butter, take out 3 tbsp of the nuts and set aside. Scrape down the sides with a spatula and continue to blend on a medium-high speed for 2-3 minutes. It will start to look like a thick, clumpy paste at this stage. Repeat the process of scraping and blending until it starts to look smooth enough for your liking. The time that it takes will depend on the speed of your blender. Once you get a smooth paste with no bits, add the retained nuts, caramel, salt, and oil. Blend again for 1-2 minutes to combine. Transfer to a glass jar and refrigerate. Can be stored refrigerated for several weeks.